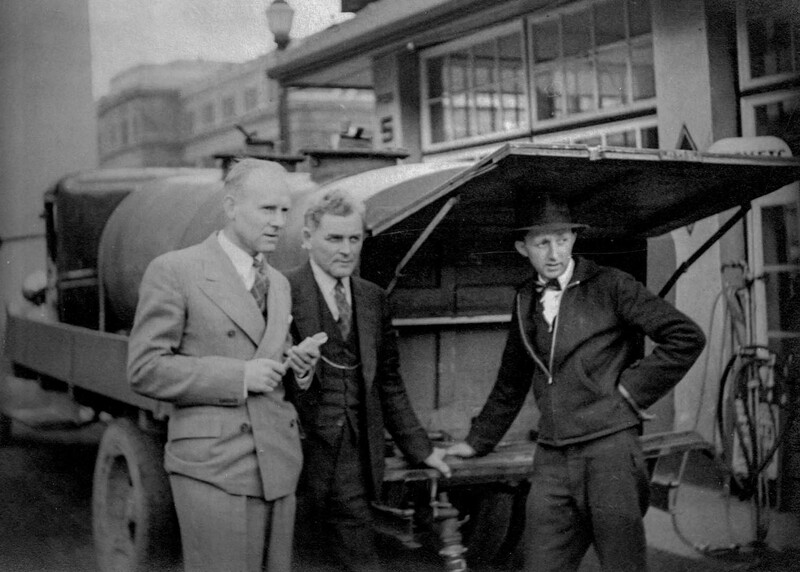 CVA 1495-33 – David Spencer’s Ltd. employees and unidentified man during gasoline strike of April 1940. The week-long, so-called ‘gasoline strike’ of April 1940 should probably more accurately be called an embargo or boycott. This wasn’t a withdrawal of labour, thus inconveniencing management and pressuring the latter to negotiate with labour’s trade union representatives (the common meaning of ‘strike’). Rather, this was an act of the oil companies of the day to pressure consumers to bring pressure to bear on their elected representatives. This episode had that effect, but probably not quite as the oil companies had in mind. The province of B.C. appointed a Coal and Petroleum Products Control Board in 1938; the Board issued an order fixing the retail price of gas. That ‘tore it’ as far as Big Oil was concerned; an injunction was sought and a legal tussle was begun. The Supreme Court of Canada, in April 1940, ruled that the province was able to establish the Control Board. A compromise agreement was reached between Big Oil and the Control Board. In most regions of the province, the consumer would enjoy a two-cent per gallon cut in gas prices. The retail dealers and wholesale distributors would each be expected to eat 1 cent of this cut. The Gasoline ‘Strike’ of 1940 was over. It isn’t clear to me whether the amended B.C. Act was ever proclaimed into law. It seems to me that it would have been vulnerable to legal challenge. The Supreme Court of Canada was not, until 1949, the highest court of appeal. At this time, the oil companies could have sought leave to appeal to the Judicial Committee of the Privy Council in the U.K. This entry was posted in politics and tagged automobiles, bc, history, oil companies, vancouver. Bookmark the permalink.